We have had some cold Spring days by us recently, even some late snow flurries! These cold days have made me want comfort food all the more. 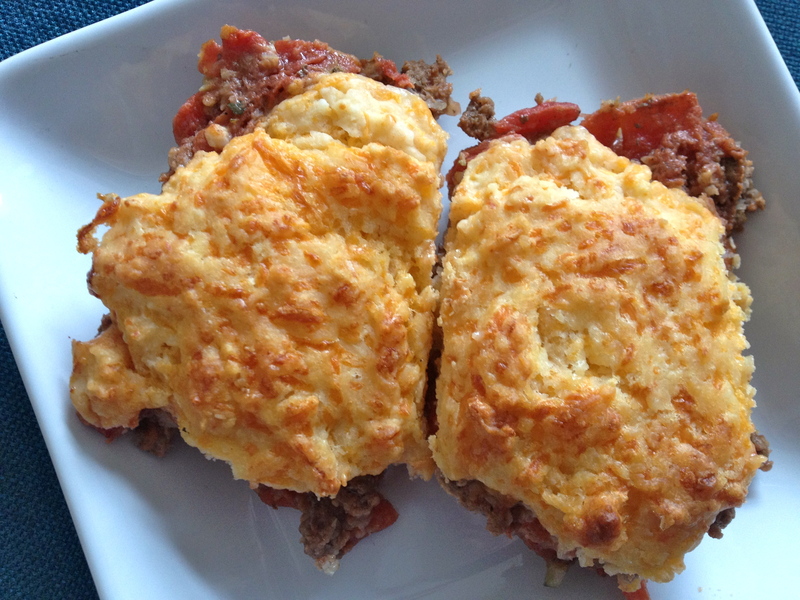 A few years back I came across a similar recipe for this Beef and Cheddar Pot pie. It quickly became a favorite meal. Though it calls for 1 1/2 pounds of ground beef, I often just put 1 pound of beef and bulk up the meat mixture with some added veggies. This meal is one of my favorite meals to bring to mom’s who just had a baby. 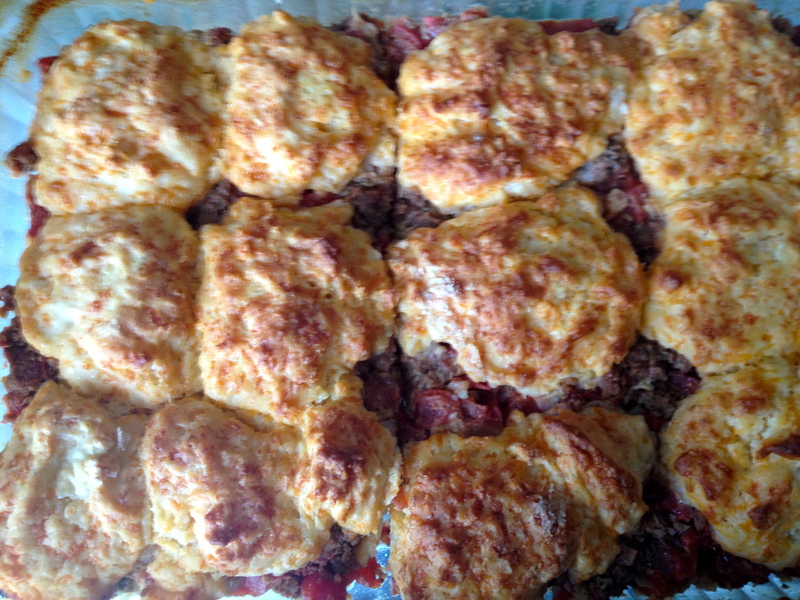 Typically these families receive a lot of chicken and pasta, so the beef and cheddar offers a nice variety. The mom, dad and kids all love this dish. I usually pair it with simple sides like a salad and green beans, and sometimes even roasted potatoes. 1. Preheat oven to 375 degrees. Grease a 9×13 baking dish. 2. Brown the ground beef and diced onion together in a large skillet over medium heat. 3. Stir in tomatoes and broth. Season with salt and pepper. 4. 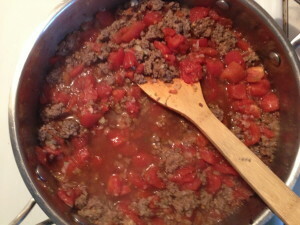 On low heat, simmer meat mixture, stirring occasionally, for about 20 minutes. Pour into baking dish evenly. 1. In a large bowl, combine flour, baking powder and salt. Cut in butter and cheese with a pastry blender. 2. Add milk and stir with fork until thoroughly mixed. 3. 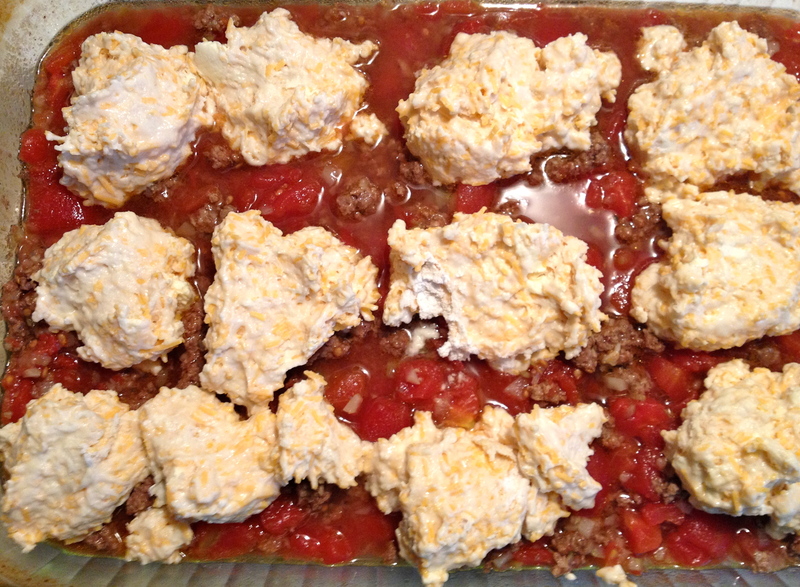 Dollop dough over meat mixture and spread evenly. 4. Bake until lightly browned, about 45 minutes. * This dish can be made in advance and frozen. To reheat after freezing, cover with foil. Bake at 375 degrees for 1 hour. Uncover and bake an additional 15 minutes. This entry was posted in Recipes and tagged comfort food, freezer meal, pot pie recipe, rachael ray magazine, shredded cheddar. Bookmark the permalink. This recipe is so delicious! Always a hit for our family! Such a tasty recipe, isn’t it? I made chicken pot pie tonight for dinner and instead of baking in a pie crust, I used the biscuit topping with it! It was delicious and nice to do something a little different with my chicken pot pie!